Sometimes, I get blessed by learning about the incredible talent that is around me locally. When I do discover someone who just amazes me by their creative capacity for expression, I feel as though I need to share this discovery with as many people that I know, and with those folks who also deeply appreciate learning more about local and regional artists. It is for this very reason that I established this weblog. To be able to write about those individuals I admire; and, in particular, to have the opportunity spending time with them in exploring their creative work, is fascinating. It is uplifting to the spirit. Summer Bliss. “This is my daughter when she was around four years old, playing in the water with two golden pups.” (Courtesy and permission of Carla D’aguanno; photo by A. Keith Carreiro, July 2017). I attend Christian Life Church in Rehoboth, Massachusetts on a regular basis. I have been going there for the past five years. One day, two years into my attendance, I met with Pastor Robert Bernier in his office and spent some delightful time talking with him about the church and about the role of the Christian church in postmodern times. On one of the chairs was placed this amazing painting. At a first, superficial glance, I thought it was a store–bought item that one might buy from Michael’s. Yet, it had an extraordinary feel to it. Plus, the image had two golden retriever puppies gamboling around the bare feet of a young child who was on the edge of a stream holding a pail and a bucket in her hands. Anything having a picture of golden retrievers immediately gains my attention. I am a true fan of this breed of dog. I have had a golden for almost all of my adult life so far. I had my first golden retriever when I was 19–years–old. His name was Frodo. Thus, in looking more closely at the framed image, I saw more of its details. I noticed the manner of the brushstrokes in what I now realized was a painting. I still wasn’t sure about its origin and nature. Yet, it was a scene drenched in sunlight and equally brimming with an overwhelming feeling of joy, even a sense of poignancy. In many ways it has a deep sense of innocence and promise. “Gumdrops is a large painting. It is a painting of three sisters and their little brother sharing gumdrops in the kitchen. This is a pioneer day setting. My cat, Pumpkin is in the painting, looking at one if the gumdrops that hit the floor.” (Courtesy and permission of Carla D’aguanno; photo by the artist). I must have still looked puzzled as I could not recall who Carla was among the folks I had met at Christian Life Church. When I went to church that next Sunday, I asked a few people if Carla was there at the service. She was finally pointed out to me. Carla was a petite woman with dark hair. She is one of those individuals you are fortunate enough to meet who seems to bear a smile on her countenance all of the time. I went over to her and introduced myself. I shared with her that I was amazed at her work. She told me a bit about it and her sense of what it was like to be an artist. “Near & Dear is a miniature of a horse and foal in the field.” (Courtesy and permission of Carla D’aguanno; photo by A. Keith Carreiro, July 2017). Over the next three years, I hoped to see some more examples of her work. 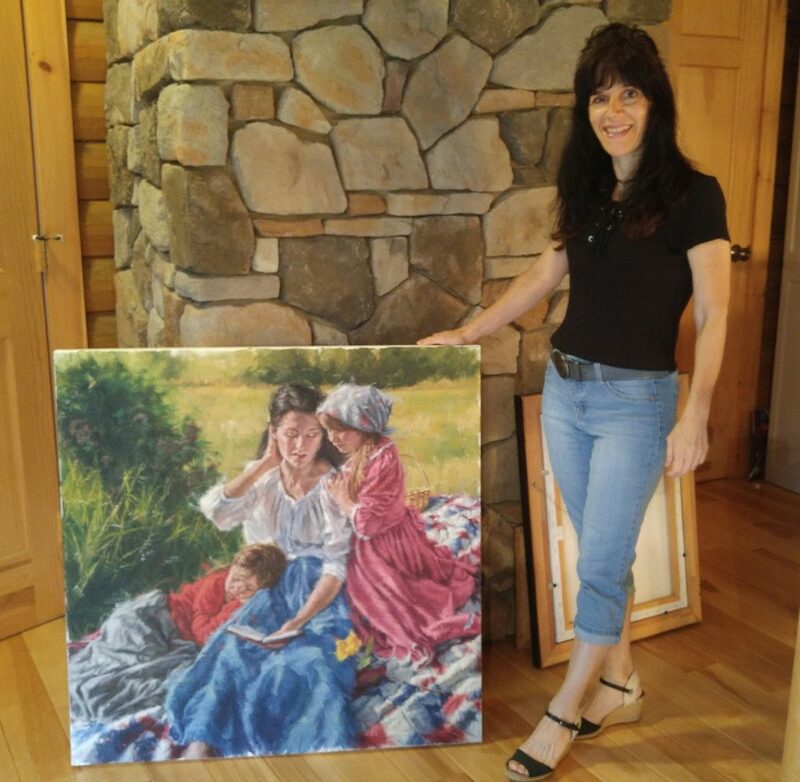 To my great delight and surprise, Diane Sailer, our Senior Administrative Assistant at the church, had collected some of Carla’s work in Diane’s office, and I was able to see more of the artist’s portfolio. This small collection consisted of Carla’s earlier work, but it was still stunning to look at and to experience visually. After starting my website and blog on New Year’s Eve of 2016, I had the idea of interviewing Carla as I thought she represents an outstanding example of visual storytelling. However, our schedules did not mesh and it was only until last week that I had the great fortune and opportunity to meet with her at her home in Rehoboth, Massachusetts. “Christmas Promise is of a father and son bringing home the tree for Christmas. 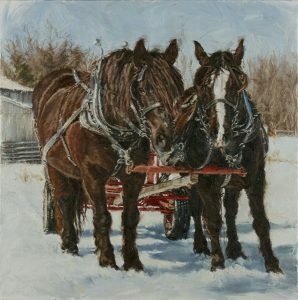 I photographed the two Percherons that are pulling the sleigh in the painting.” (Courtesy and permission of Carla D’aguanno; photo by A. Keith Carreiro, July 2017). Thus, on Tuesday, July 25th of 2017, I drove into her driveway and saw the beautiful log cabin that she and her husband Mark had built 22 years ago in 1995. Thirteen years later, they added a studio addition to the house in 2008. Containing a ground floor and second story, most of her work is done in this lovely space. Antique furniture, as well as late nineteenth and early twentieth century collectibles, are seen throughout the area. These items are used and placed in many of her paintings. The couple has a son Mark, who is 22, and a daughter Bria, who is twenty. I felt very honored to be in this sacred place. Having an artist share with you his or her innermost sanctuary where creative power is brought into a specific and explicit context is a profound experience all by itself. Being able to see what has been made right before your eyes and to hear the artist tell you about it are equally humbling experiences. 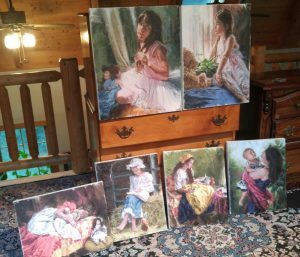 Some of Carla’s paintings (Courtesy and permission of Carla D’aguanno; photo by A. Keith Carreiro, July 2017). I’m an artist and I paint. I am a Christian and that resonates throughout my work. I work in oils. Because I love it and I cannot imagine doing anything else. I was meant to do it. I was born to be an artist. I love to go to work in the morning. I can’t stand to be away from it. While I know many who do not love what they do, I feel very blessed to do what I do. How do you work at your painting? My schedule is all over the place. After I get up in the morning and take care of the animals, I paint. Then I make lunch and do errands. It [painting] is never a full day. It is interrupted by doing errands and taking care of Titan [her dog, which is a Shiloh Shepherd]. Every day, from 5 to 8 in the evening, I spend time cooking, which consists of using whole foods, mostly vegetables. I prepare an eclectic mix of healthy Italian and a low fat diet with lots of vegetables. I guess you can say that I put an Italian twist on it. Bring in the Big Guns (Courtesy and permission of Carla D’aguanno; photo by the artist). A good day for painting for me is about four to five hours. I went to college at Otis/Parsons School of Design in Los Angeles [1982–86]. Illustration was my major. I received a BFA [Bachelor’s Degree of Fine Arts] in it. I worked in the movie poster industry. I did posters for Roger Corman [AKA, “the B Movie King in Hollywood;” “The Godfather of Independent Film;” “The Pope of Pop Cinema”]. My first A movie was the one with Erik Estrada [Hour of the Assassin, 1987]. I did that type of visual work for a few years. I got tired of the constant heat and traffic in LA. I was bounced out of my bed by a 6.2 earthquake in 1988. I left as a result. I picked up agents in NYC. I moved back home to Rhode Island where I started doing YA book cover illustration. Harper Collins Pocket Books, Tom Swift, was my first series. Then I did romance covers. Mark and I were married in 1992, then had children, and I realized I could not do any paintings having two–week deadlines. I transitioned into fine art and started painting children. 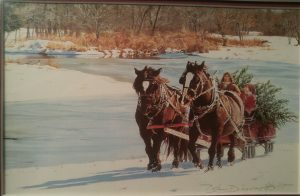 My attention and focus of painting turned toward children and the pioneer days. I developed a fascination for the Old West and developed a following. I moved to Rehoboth and there were so many beautiful horses here that I started painting them. Horses and children in the Old West are what interested me. My work is in Fredericksburg Art Gallery, Fredericksburg, Texas, as well as the Studio Gallery in Waco, Texas, and the Concetta D Gallery in Albuquerque, NM. I have a licensing agent and I am with The Ansada Group, which is in Sarasota, Florida. 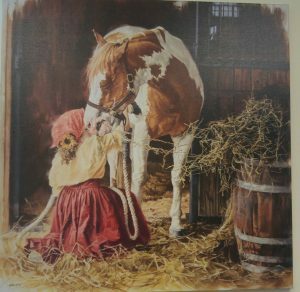 “Sabino Charm is based upon a photoshoot I had where I photographed a Sabino paint horse. It was taken in a friend’s barn. 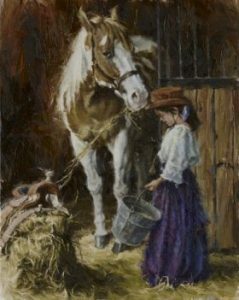 My daughter is feeding the horse.” (Courtesy and permission of Carla D’aguanno; photo by the artist). Having children. Changed my life. When I was in high school I said I would never have them. I didn’t have an affinity for them. Once I had my own, seeing life through their eyes, was like a rebirth. I try to recapture the days of innocence that you don’t see in this world. Little House on the Prairie [1974–1983] was a big influence. Home then was a cozy place and life was just so uncomplicated. I like to capture that feeling, my childhood in a lot of ways, in my painting. My style has evolved. I used to be an illustrator by nature; now, my paintings are more painterly, more impressionistic. A representational style has emerged in me that I never knew was there. It is still evolving in me. With what visual art do you most identify? Cooking in the kitchen with my mother. My mother taught me how to cook, especially all the old-fashioned Italian dishes. For example, I put the corn meal all over the sheets to make the homemade pasta. Then there is the trip to California with my dad when we went to check out my college. Having Bria. She was born in a blizzard in 1997. There was two feet of snow on the ground. She was born in the hospital on the way to the delivery room. She popped out while I was being brought there on a gurney. They were taking the corners so fast . . .
Who are some of your favorite art/artists’ work? Renoir [1841–1919], Mary Cassatt [1844–1926], da Vinci [1452–1519] . . .
(Courtesy and permission of Carla D’aguanno; photo by A. Keith Carreiro, July 2017). I am like a hermit, but my TV is on all day. It’s like company to me. I love the peace and quiet. Just me and my easel, and my animals around me all day. It is a setting that I am happy in and accustomed to having. I like how I can just blot everything out and focus on the painting, and how it is all about the emotion and the movement in the painting that I am capturing. I go online and research the background that will help tell the story I am trying to convey with the subject matter. I harmonize the figures with the background to get across the mood of the story I am trying to paint. If I could be Jim Carrey’s character in Bruce Almighty  . . . I cannot stand animal abuse. I’m sorry if this will offend some people: if I could be given the power of God for a day, I would probably wipe out anyone hurting an animal. I have no tolerance for child or animal abuse. “Little Mama: This piece reminds me of my mama doll I had when I was a little girl. The doll looked so real and she was big like the doll Abby is holding. It’s a childhood memory.” (Courtesy and permission of Carla D’aguanno; photo by the artist). When everything is in sync, and I can just tell even before I start the painting that it is going to be a good one. Favorite or most inspirational place (in our area)? Barns, I love them. I do a lot of photoshoots in barns as well as children in them. 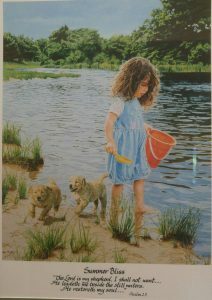 I love to see the interaction between children and animals, which is a highlight that I try to capture in my painting. What role does your faith play in your artistry? It is everything. My work is what glorifies the Creator. 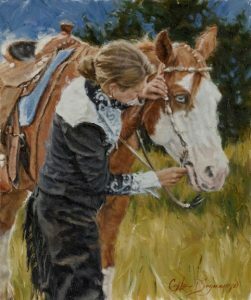 I try to capture the beauty of every subject and every animal; to paint it in the most beautiful light because God created that horse or child. I try to capture that for God’s glory. Magnificent Blue Eye (Courtesy and permission of Carla D’aguanno; photo by the artist). What lens are you looking through in your art work? 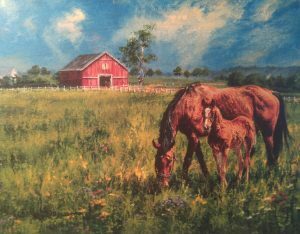 When I paint children it is through the lens of a child; if it’s a horse, the animal kingdom. I am always curious to hear about an artist’s obsessions, the things s/he can’t stop thinking and wondering about, the stuff that keeps one up at night. I try to live every day, that day; not think of the next one. I work on the project of the moment, and how I can’t wait to get into the studio to get started. What do you look for when you’re looking for something to draw? Normally, the conception of a painting comes from me seeing an adorable child. God will give me an image of what the child is doing. Then I might see a child who is appropriate for that painting. I will see the image before it is painted, or I will see it from a photoshoot collection. God will tell me what to use, especially with all the antiques I have bought. God is the one who gives me the ideas and that is what sets in motion the painting. Why did you choose oil as your medium? Showing off the Paso Fino (Courtesy and permission of Carla D’aguanno; photo by the artist). Oil is very forgiving. I love how you push it around the canvas. It is creamy. I love the texture. I love how you can control the thickness, the transparency of the paint. The arrangement of the painting all depends on what is visually appealing. It determines the priority of the subject, what goes in the foreground. It is really what is visually appealing and what can be harmonized in the drawing of the idea’s conception. Every artist is unique. No artist can be another artist. Everyone has a different gift. There is only one me. My favorite Scripture is Mark 11:24. ‘God don’t sleep.’ From my mother–in–law. ‘God is working,’ (Joyce Meyer). I am glad that she has followed her calling. There is something magical about artists who revel and take delight in the talent God has given them. 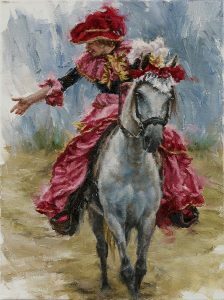 Carla’s paintings seem to be infused with such goodness and brilliance of life in a more innocent time in our history. Yet, her work nevertheless represents the wealth of beauty that is around us in the present, if we but notice it. Certainly, she is touched by the inspiration that God provides her. I consider her a great visual storyteller. I hope that you do as well . . .
“Dolls & Flowers: This painting is a pioneer day genre with Clare and her dolls in the kitchen where she is playing with flowers in a vase near the window.” (Courtesy and permission of Carla D’aguanno; photo by the artist). 1 The first 16 questions used in this interview were taken from the UK site “Arts Culture”. Some of them were modified for facility of use in this interview with Carla.